With such a transparent and simplistic business model at its core (the trading of one currency for another) scandals in the Foreign Exchange Marketplace are a blissfully rare occurrence, especially when compared to the size of the industry as a whole. There is no insider-trading or market manipulation in Foreign Exchange. No marketplace is entirely secure however, and rogue traders, that is, traders who use money that is not their own, for trades that are not authorized, do occur. One of the most famous of these was the story of John Rusnak. Mr. Rusnak was a currency trader with Allfirst Bank, which was then part of the AIB group of Baltimore, Maryland in the United States of America. During his time at Allfirst, he engaged in a series of risky and unauthorized trades that resulted in the loss of six hundred and ninety one million dollars of investor money. Further, Mr. Rusnak hid the scope of the losses from even the bank, which compounded the issue and allowed it to snowball beyond the initial losses. In 2003, after a plea bargain was struck with US federal prosecutors, Mr. Rusnak was sentenced to seven and a half years in prison and five years of probation for his crimes and duplicity. Had he gone to trial, Mr. Rusnak could have faced up to thirty years in prison. The result of his plea barging, in which he avoided trial for a reduced sentence, was the lowered prison time and the agreement to return one thousand dollars a month to the bank for the five years of his probation. The Prosecutors have indicated that Mr. Rusnak is liable for the entire sum of money lost, but his ability to repay it to the bank depends on how much money he is able to earn after his release from prison. It is unlikely he will ever return to a profession where fiscal responsibility and trust are a requirement, and his earning ability is in some doubt. American laws also prevent a criminal from profiting from his crimes, and this has been interpreted to include book deals or movie rights. After the losses sustained by Allfirst and the damage to AIB's reputation, AIB sold Allfirst to the M&T Bank of Buffalo, New York, United States of America, in July of 2003. The AIB Group received 23 percent of M&T's stock in this exchange. 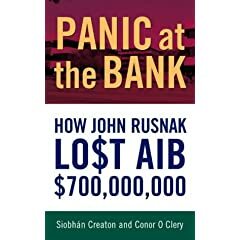 Panic At The Bank is a chronicling of the events by Irish journalists Siobhán Creaton and Conor O'Clery. They both work for The Irish Times. Panic At The Bank details the secretive and ill-understood events and policies that allowed the fraud to happen, and how it was carried out and then obfuscated from the bank's authorities. This book was published by Gill and Macmillan.